The 2013 Honda Fit is one of the leading compact cars on the market, and we’re very proud to offer it here at Middletown Honda. The Fit is a fun-to-drive, well-rounded subcompact with incredible cargo room and cabin space. It has proved itself to be a desirable small hatchback, though it’s certainly not the only vehicle in its class. In fact, there are many models that are trying to stand up to the Honda Fit, like Nissan’s 2013 Versa, but we think that after you compare them against each other and look at the facts, you’ll see that Honda is the way to go. Honda automobiles have a reputation as some of the safest on the road, and that’s a trend that continues with their new hit compact. The 2013 Fit earned a four-star overall crash test rating from the NHTSA, earning five stars for their front driver crash test. The Versa, on the other hand, received only three stars overall, managing only two stars on the front passenger crash safety test. 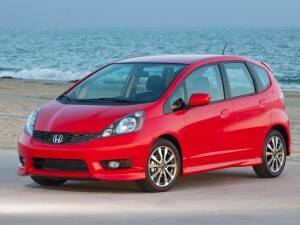 Not only have Honda’s engineers designed a safer automobile, but the Fit is more fuel-efficient than the Versa too. Honda’s hatchback features an EPA-estimated 35 mpg highway fuel economy (base model with an automatic transmission)* compared to Nissan’s 31 mpg on the highway. Cruise control is one of the many standard features of the Honda Fit that the Versa doesn’t include. Other such features are a multi-function remote, telescoping steering column, seatback and underseat storage, and the optional, leather-wrapped steering wheel of the Fit, which you can’t find on the Versa. There’s more space available overall in the Fit too, including another 7 cubic feet of cargo storage. While we think it’s clear that the Honda Fit is victorious over the Versa, we think you ought to take it for a test drive and see for yourself. If you find you’re looking for something a bit different than a compact car, we carry Honda’s full lineup of new models as well as a selection of pre-owned vehicles from all makes and models. Drivers looking for more information about the Fit should contact our sales team today and schedule a test drive.